Toss the asparagus and fennel in olive oil and chargrill on a smoking-hot griddle pan until tender. Toss immediately in the sherry vinegar and mustard. Divide the wild rocket between four plates and scatter the pea shoots, caper berries, almonds, parsley, asparagus and fennel over. 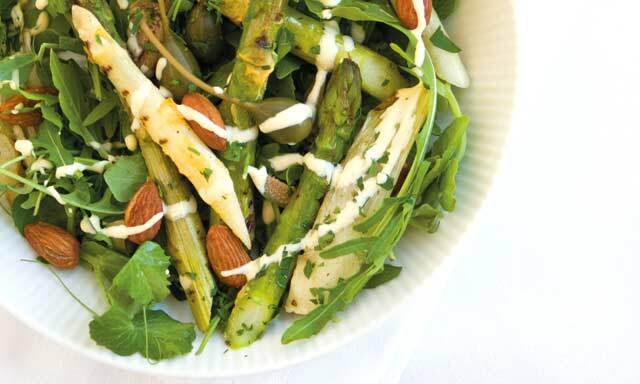 Combine the hollandaise with the chilli and paprika and serve drizzled over the salad. 1. Simmer the vinegar, bay leaf and peppercorns until reduced to 1½T then strain. 3. Set the bowl over a pan of gently simmering water (the bottom of the bowl shouldn’t touch the water) and whisk in the butter a little at a time until all the butter has been added and the sauce is thick (a stick blender or electric hand whisk make this an easier task – see ‘Shortcut’). Season with salt, white pepper and lemon juice to taste.